An Anacharis plant is one of the more readily available and popular plants available in pets stores today. An Anacharis plant can be a good choice for hobbyists keeping low tech community tanks. Anacharis has a reputation of being adaptable to a wide range of water conditions. 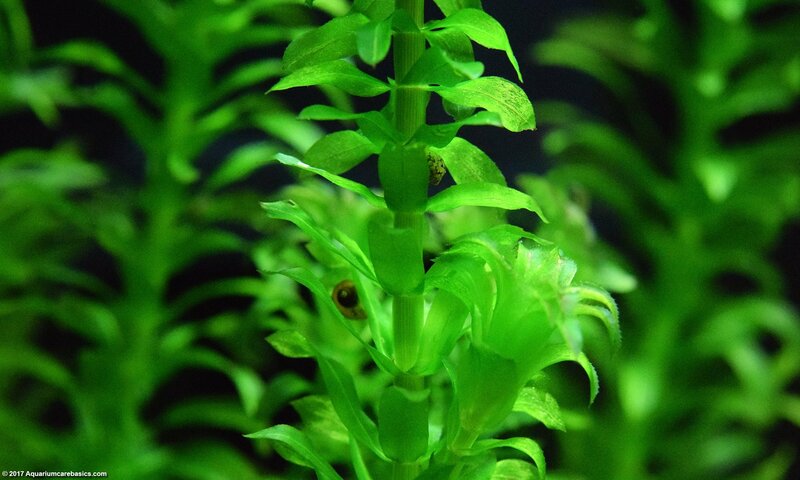 An Anacharis plant may be called Brazilian Water Weed, Waterweed or Elodea. What To Look For When Buying An Anacharis Plants? Where Can I See Anacharis Pictures? How fast is Anacharis Growth Rate? What About Anacharis Propagation And Reproduction? When buying an Anacharis plant, look for plant specimens with sturdy green stems and numerous vibrant green leaf blades. Healthy Anacharis leaves grow out from its long stem, and are flat and durable. Anacharis stems are generally 6 to 8 inches in length in the store. They are often bunched together at their base by a small, tight fitting rubber bands. An Anacharis plant may have fine, short white roots growing from the base of their stems. Anacharis plants may also have longer delicate white string-like roots growing outward from other parts of their stems. Avoid buying an Anacharis plant if it has limp stems or stems that are few in number. Also look to avoid plants with very dark green or black leaves, or leaves that look like the are dying, decaying and decomposing. Because an Anacharis plant is so adaptable to a wide range of water conditions, Anacharis care is relatively easy making it one of the best plants for beginners. An unlike many other types of aquarium plants, Anacharis care challenges are not so much about keeping the plant alive, but instead keeping the plant from growing so well that it overtakes the tank. While an Anacharis plant is suitable for any size tank, plan the aquascape with its growth rate in mind. But what makes Anacharis care easy is that it can grow either by planting or floating. Water Temperature: An Anacharis plant can thrive in a wide range of water temperature. For tropical community tanks, the temperature range is 72 – 78 degrees Fahrenheit. Anacharis plants can also survive in much cooler environments, with some hobbyists suggesting temperatures as low as 60 degrees Fahrenheit. Water Parameters: Anacharis plants can do well in a wide range of water conditions, but they like water on the hard side with pH in the 6.5 – 7.5 range. Aquarium Lighting: An Anacharis plant does well under moderate light. Anacharis plants can die in low light tanks. Anacharis plants can also do well in high light situations. But if aquarium lighting is too intense, or on for too many hours, green hair algae or other algae can begin to grow on Anacharis plants. This is especially true for older stems and leaves that are closest to the surface. When planting Anacharis the first thing to do is gently remove the rubber band from the base of the stems. The tight banding serves to keep the plants together and looking good in the display tank. Planting Anacharis with banding in place can damage the stem. The stem below the rubber band can die, decompose and rot away in the substrate. Once the rubber band is removed, separate the stems. Inspect the stem bottoms for cracks caused by the banding and gently trim off the any damaged portions. It may be necessary to trim the stems about a half inch or so, but usually not much more than that. Once the stems are ready, planting Anacharis is easy. Simply place each individual stem into aquarium gravel or nutrient rich substrate about two inches deep and about an inch or more apart. Planting Anacharis stems too shallow will result in floating stems, and planting stems too close together will not provide room for growth. Planting Anacharis as a background plant, with shorter stems being place in front of longer stems makes the most sense given its growth potential. Stems will grow toward the surface and then across the surface, creating a forest-like look. As they get longer, the stems may curl down again creating a dense arch across the top of the tank. Over time, planted Anacharis will grow fine and delicate roots that branch throughout the substrate. 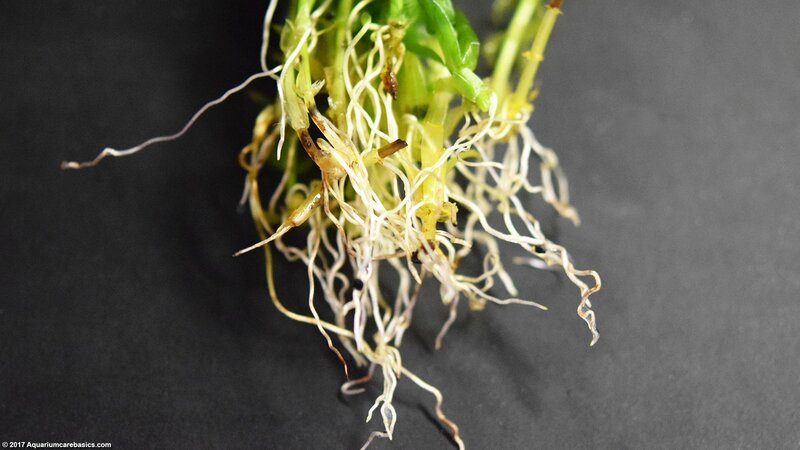 Planted root systems are fine, white and can be extensive, but they are not as robust as Amazon Sword Plant roots, for example. Planted Anacharis can also develop roots from anywhere along the stem. Some of these roots grow to the substrate and others just dangle in the tank water. For as easy as planting Anacharis is, floating Anacharis is even easier. After the rubber band is removed and the stems are trimmed as necessary, just float the stems in the water. All things being equal, floating Anacharis grows faster than planted Anacharis because more of a floating Anacharis is closer to the light source. Anacharis plants have a reputation for being good at drawing their nutrients from aquarium water. Its also suggested that this efficiency allows Anacharis plants to out compete some forms of algae for the nutrients needed for their growth. Anacharis growth rate can be very rapid under the right conditions. Generally, more intense light for longer hours, adding plant fertilizer, or CO2 supplements all can cause Anacharis plants to grow very quickly. 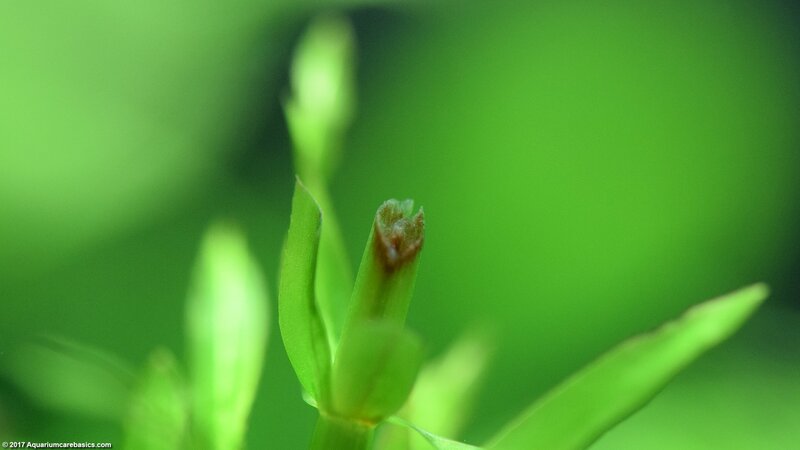 Anacharis stems grow long, as well as shoot off branches from the sides of their stems. Dense Anacharis growth often provides great cover for aquarium shrimp and fish that need a safe place to hide. 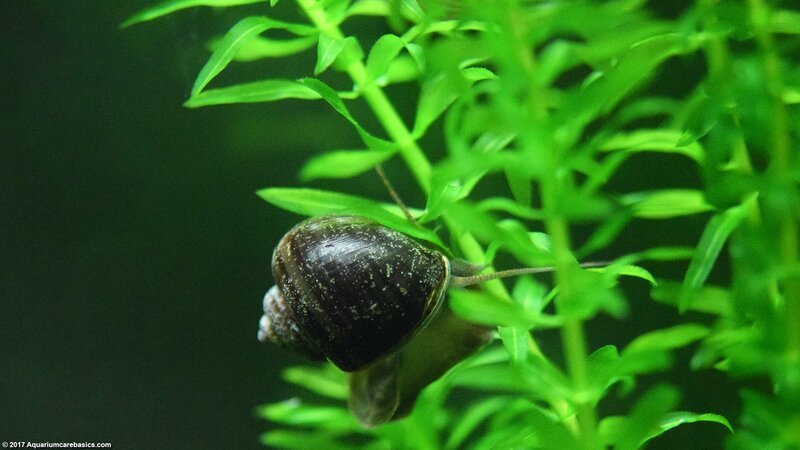 If an Anacharis growth begins to take over a tank, gently trim away some of the long stems. An Anacharis plant can be a live vegetation dietary source. Some Cichlids, Goldfish and Apple Snails may be very interested in eating it. Another Anacharis care issue relates to reproduction. An Anacharis plant is essentially a long stem. 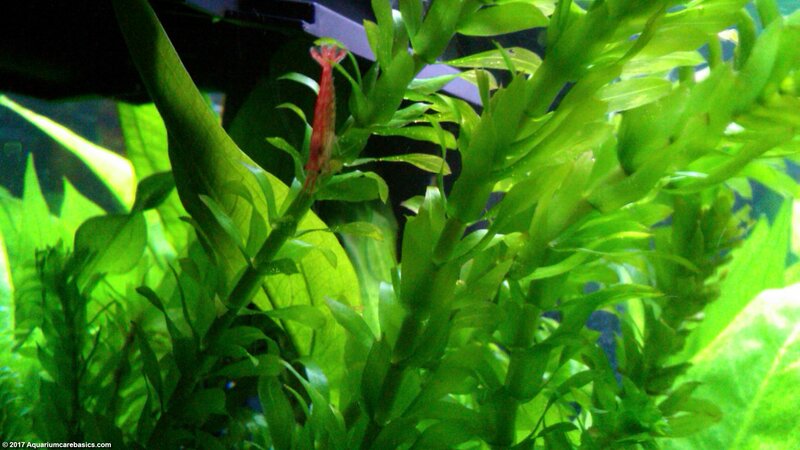 The plant does not have a crown, rhizome or tubers like other types of aquarium plants. Its does not reproduce by shooting off runners or growing plantlets. Anacharis propagation occurs by simply cutting the stems, and either planning or floating the cut portion. Anacharis propagation works best of the cutting are about 5 inches in length or more, with an abundance of healthy green leaves on the stem.